Thinking of changing your Email Service Provider? Good marketers will always be looking to improve the way they deliver their marketing, including the suppliers they use. Choosing an Email Service Provider (ESP) can be a challenge in itself. With a plethora of providers, all promising the earth, it’s important to choose a partner you’ll be happy working with. But sometimes, you might feel the grass is greener elsewhere and be looking to make a change. But changing ESPs isn’t like changing printers or advertising agencies. Creating new sending domains, ensuring accurate permissions are migrated and creating brand new templates are just a few things you need to consider. Get it wrong, and your entire email marketing strategy can fall off a cliff. 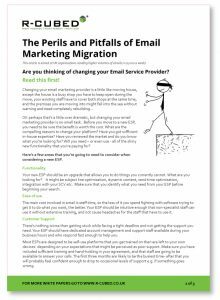 We’ve helped many companies migrate their email marketing to a new platform, so we’ve put together a white paper on the perils and pitfalls of changing ESPs. Just click here to read it. And if you ever need any help, just get in touch. We’ll be happy to help.